We are the leading manufacturers and suppliers of the Carving Stone Vases. One of the most unique items, the set of vases are crafted with stone on metal. And what makes them unique is the natural polish, giving them a class of finish. Dimension : Top-30" x Bottom-22" x Height-12"
Royalty of this Sandstone Flower Vase will add a rich flavor to the interior decoration. 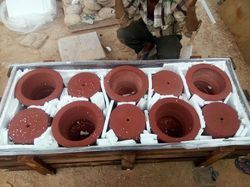 To meet the needs and requirements of the clients, we are offering a quality approved array of Stone Vase. 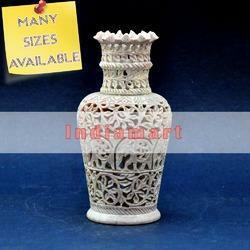 The Stone Vase we offer is widely demanded for its availability in various designs and patterns. Offered products are made by using quality material. Moreover, one can get these products in committed time bound. The offered Stone Carving Vase is designed by using marble stone. Our offered stone carving vase is very stylish and decorative. We offer a high quality of Carved Sandstone Vase. These Carved Sandstone Vase are designed beautifully by the skilled professionals. We offer our products at pocket friendly price. We are prominent leaders in offering Natural Stone Vases. The offered vase is designed and crafted by qualified professionals using optimum quality marble and crafting methodologies. These products are available in various sizes and designs that are suitable for the decoration of house. Our exquisite array of chamfered vases is available in a range of sizes and colors. The range of our vase can be availed in different shapes and their designs. Width at top: 32"Width at Base: 16"Width at Base: 21 "
Stone Vase Zoom We are offering an enticing range of Stone Vase. Our Stone Vases are durable elegant and timeless. These Stone Vases have been in demand for ages and will ever remain so. These Stone Vases are meticulously crafted and carefully polished to bring out the natural beauty of the stone and also, creativity of man.